The participants in the Salt Satyagraha (Salt March) led by Mohandas Gandhi reach the Indian Ocean coast near Dandi. They had set out on their journey on March 12, in an act of non-violent resistance to the British-imposed tax on salt in India. 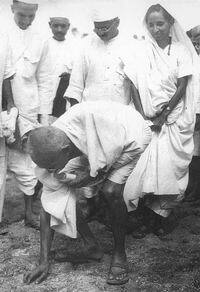 Gandhi himself makes salt from the sea in violation of the British edict. Feeling their hold in India threatened by this mass disobedience, the British imprison more than 60,000 people.